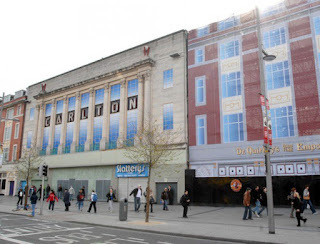 After sitting idle for decades, the site of the old Carlton Cinema on Dublin's O'Connell Street is finally going to be redeveloped. 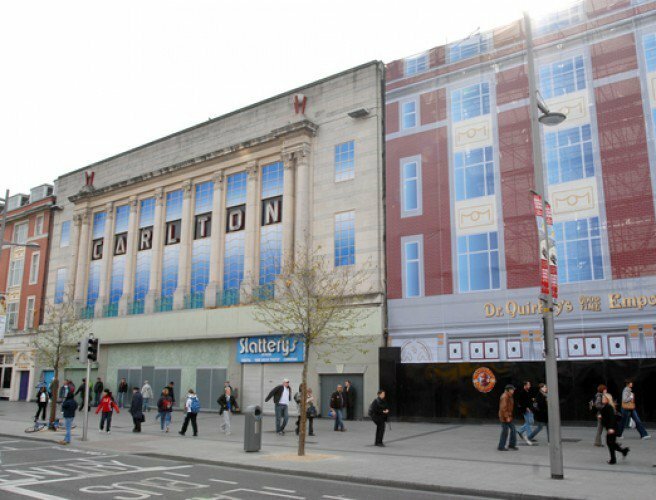 The company behind Dundrum Town Centre has named the architect it wants to develop a vision for that space that will be known as Dublin Central. Six acres - from Upper O'Connell Street to Parnell Street to Moore Street & Henry Street - are going to be turned into a high-end retail centre. ACME Architects have been told to protect the sites connections with the 1916 Rising, while promoting economic and employment opportunities. The developers of a planned 343 unit aparthotel on the site of a Keelings owned fresh fruit and veg distribution depot in Dublin are facing a couple of potential ‘banana skins’ over the plan. 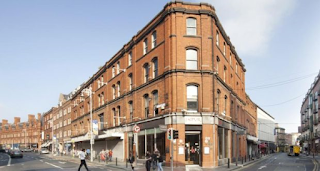 LMS Investments is intending that apart-hotel firm, Staycity operate the planned seven-story apart-hotel at Dublin’s Little Mary Street. The site is owned by fruit and veg distributors and producers, Keelings and director, William Keeling has provided his written consent for the plans to be lodged. A report lodged with the application states that the aparthotel will be operated by Staycity. 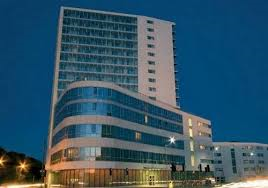 The documentation states that Staycity was established in Dublin in 2004 and currently operates 2,000 rooms in Ireland, the UK and France with plans to increase the number to 5,000. This article from September 2013 shows how these problems are not going away. Hundreds of apartment blocks built during the boom around the country could be as dangerous as Priory Hall, fire safety experts have warned. Many apartment complexes share the same problems identified in the Tom McFeely-built block of apartments in north Dublin. And fire safety inspectors who have been called to examine blocks say owners and management companies are "burying their heads in the sand" over the dangers. One expert in the area of fire safety said last week that not only were residential buildings potentially dangerous, but so too were schools, healthcare premises and office buildings that went up in the boom era. When asked to give an estimate of the number of potentially fire-hazardous buildings that were built during the time, the expert told the Sunday Independent: "No one knows, but hundreds, certainly hundreds." Fire safety in buildings has again become an area of major concern following on from the disaster in Grenfell Tower in London, and, more recently, the Metro Hotel fire in Ballymun. In Ireland most buildings must have a fire safety certificate, but what does that mean? If I ask people not directly involved in the building industry what a “fire safety certificate” is, most will reply that it is a certificate confirming the building is safe in relation to fire. This is not an unreasonable assumption but it is not an accurate one. The certificate is issued at design stage and it confirms that if the building is built in accordance with the submission made to the local authority, it will be safe. That is a significant difference and renaming it a “fire safety design certificate” would at least bring more clarity to the public. This goes to the heart of a difficulty with Ireland’s certification processes; we offer certs that the public is fully entitled to take at their word but that can – and probably do – mislead. O’Brien told TheJournal.ie that his members have been “calling for a proper robust risk assessment” of the city to be carried out. He said this would give firefighters an indication of the type of structure they are dealing with – and any potential fire safety concerns - before they even arrive at a scene. An Bord Pleanála has refused planning permission for a proposed Lidl supermarket in the Cork suburb of Douglas, disagreeing with the recommendation of its inspector. The board determined such a development would run contrary to the local area plan. An inspector had recommended granting permission for the supermarket to be built on a two-acre site behind Barry’s Pub, between the Carrigaline Road and Churchyard Lane. Cork County Council had granted planning permission but submissions from the local Tidy Towns group, along with businesses including Barry’s Bar and Tesco, expressed concerns over traffic, parking, and the visual impact the proposed supermarket would have on the village. The site is located in a designated Architectural Conservation Area. A planning probe is under way following the erection of a fast-food giant’s advertising signs on a historic laneway entrance to Cork’s famous English Market. Cork City Council confirmed yesterday that it has no record of a planning application for the two Burger King signs which have appeared on a structure over Market Lane. A spokesman said that following an inspection of the signs, planners are satisfied that the structures are not exempt from planning and that the issue is now being pursued through the planning enforcement process. The issue was first highlighted on social media earlier this week by chef Kate Lawlor, who tweeted a photograph of the signs which have been attached to either side of an overhead structure which straddles Market Lane — the laneway between the fast-food outlet’s St Patrick’s St branch and the rear of the regenerated Capitol building. Michael McDowell: When the Luas Green Line was first announced and planned, its route was right beside where I live. I welcomed the project then and still have good feelings about it. Those, like me, who live near it are entirely used to it, including peak-time noise levels which are certainly no louder than road traffic in an urban setting. I would have no objection either to its becoming a metro light rail – if that makes economic and social sense. Like many projects, the Luas Green Line has become a victim of its own success. 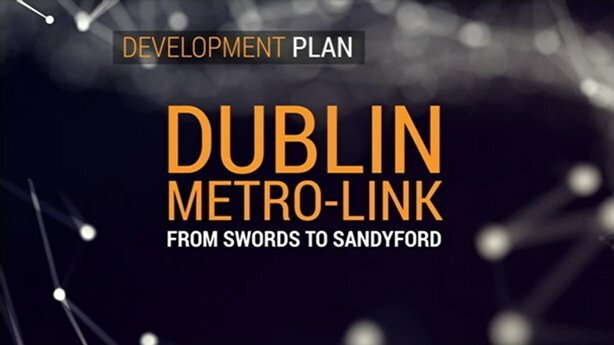 The result of the cross-city Luas project has not yet been what most people expected. Its extension to Bride’s Glen and the failure to punctually provide extra extended-length tram sets for the line has resulted in Tokyo-like over-crowding for rush-hour commuters. The few longer tram sets delivered to date have now encountered technical problems and have been withdrawn so that those problems can been remedied. Cliff Taylor: We need solid evidence before starting this €4bn tunnel. I’ve been Metrosceptical for a long time. It’s no surprise that the Metro plan, cancelled during the economic crisis, is back on the agenda again. And I’m willing to be persuaded it is the right thing to do, in some shape anyway. But it is likely to cost up to €4 billion and if we are going to spend that amount of money on one project, we need to be as sure as we can be that it is going to work. A long vacant Dublin building may finally get a facelift after a planning application was submitted for 41-46 South Great George’s Street. The plan, submitted by Grosam Properties Limited, proposes building a hotel on the site of what was the Dockrell’s hardware store until the 80s and an outlet shoe shop until the early 90s. In total, the retail unit of the building has been vacant since at least the early 1990s. An Indian restaurant operated in the end of the building until 2015. The Grosam plan proposes building a 100-room hotel with a restaurant and three retail units. The site has been on the vacant property register and in 2016 was resecured by the Dublin City Architects. Cork's Main Street will be inaccessible to cars from 3pm today under a new strategy. The change is part of the City Centre Movement Strategy was voted through at a meeting of the council in November 2016. It includes works which: Close St Patrick’s Street to private car traffic between 3pm and 6.30pm; Reduce the time a motorist can park to an hour in many areas; Install CCTV at many junctions around Patrick’s Street; Add a pedestrian crossing between Cook Street and Opera Lane; Make pay parking up until 8.30pm instead of 6.30pm. 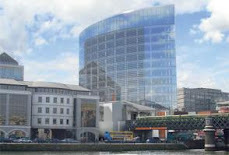 The strategy also contains major plans for the Bachelor’s Quay and Grattan Street areas. The operator of the Poolbeg incinerator has been fined €1,000 and ordered to pay €14,000 in costs after a “glitch” led to breaking its environmental protection licence during its first week. 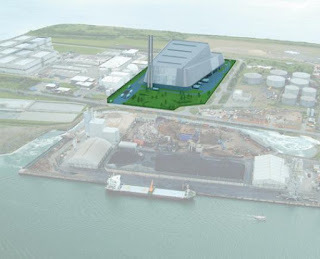 The power plant at Pigeon House Road, Poolbeg, Dublin 4, which began operations in June last year, aims to convert waste that cannot be reused or recycled into clean energy to produce 60 megawatts of electricity, enough to power 80,000 homes. It is run by The Dublin Waste to Energy project – a public-private partnership between Dublin City Council and recycling and energy company Covanta. Dublin Waste to Energy Ltd faced six counts of breaking conditions of a licence for the facility granted by the Environmental Protection Agency (EPA). Historic buildings such as Dublin’s Custom House should be used solely as tourist attractions, it has been suggested. 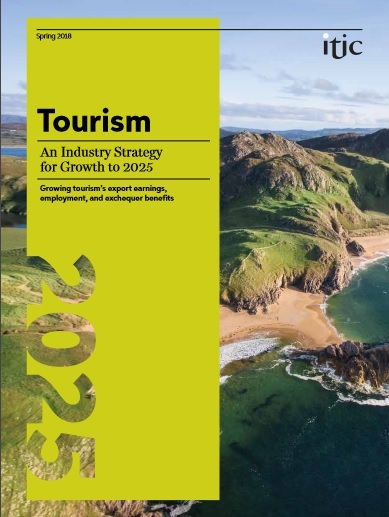 The Irish Tourist Industry Confederation (Itic) today rolled out an eight-year national strategy for the hospitality sector to grow overseas tourism revenue from €4.9 billion to €8.1 billion by 2025. Among the 40 policy recommendations in Itic’s report is a government audit of State-owned buildings that could be relinquished to the tourism trade. Itic chief executive Eoghan O’Mara Walsh said there are a number of buildings under State ownership that could be used to improve the overall quality of Ireland’s tourist offering and ease overcrowding at existing attractions. An Taisce has called on the planning appeals authority to overturn the decision of Limerick City and County Council to approve planning permission for the proposed International Rugby Experience in Limerick’s city centre. 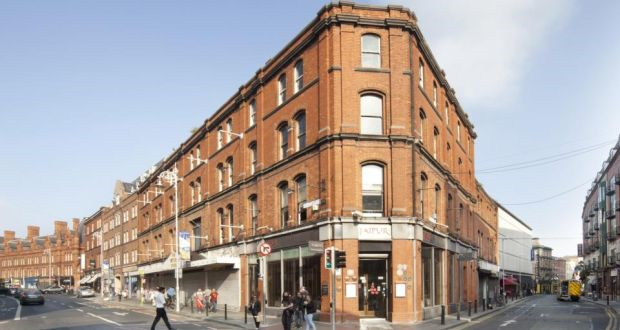 The development requires the demolition of several Georgian buildings on O’Connell Street and Cecil Street, to make way for a 30,000 sq ft multi-media visitor centre celebrating the history of rugby. A corner shop within the buildings due to be demolished, Fine’s Jewellers, is being retained. The seven-storey building, with a two-storey portico, will also house exhibition and education space as well as a shop and café at ground floor level. The proposed 32-metre high visitor centre is located in an Architectural Conservation Area. Council officials are being hampered in their quest to restore derelict sites and houses in Co Cork as many of the properties are in the hands of financial institutions which can escape penalties applicable to private owners. Members of Cork County Council will shortly seek to have the laws relating to all derelict properties tightened up after officials prepared a report, on the issue, for the Macroom/Blarney Municipal District Council. The municipal body decided to shortly seek the backing of the entire 55-member chamber before petitioning Minister Eoghan Murphy who heads Housing, Planning and Local Government. The report showed, in a number of cases, sites and properties acquired during the last boom were in a state of dereliction. Many are the subject of ‘mortgage judgements’. However, there is no requirement for a financial institution to share information with a local authority or assist a council in its efforts to try and engage with the property owner. More than 40 families face homelessness in Clondalkin, Dublin, in less than a month after An Bord Pleanála refused permission for an apartment block already built and tenanted. Among the families at Larkfield House, Coldcut Road, are 19 formerly homeless households and others supported by South Dublin County Council with the housing assistance payment. Earlier this month the council suspended assistance payments to residents following a planning inspection. These households are now in rent arrears and were last week given one month’s notice to quit. Permission was initially granted by the council for 27 apartments at the site of the former Liffey Valley Fitness premises, in September 2016. However up to 48 apartments were built. An Bord Pleanála's assessment and decision can be viewed here. Planners say project would unacceptably impact on area’s archaeological heritage. An Bord Pleanála has overturned a decision by Meath County Council and refused planning permission for a 50-acre solar farm on a site in Kilbrew, Co Meath. 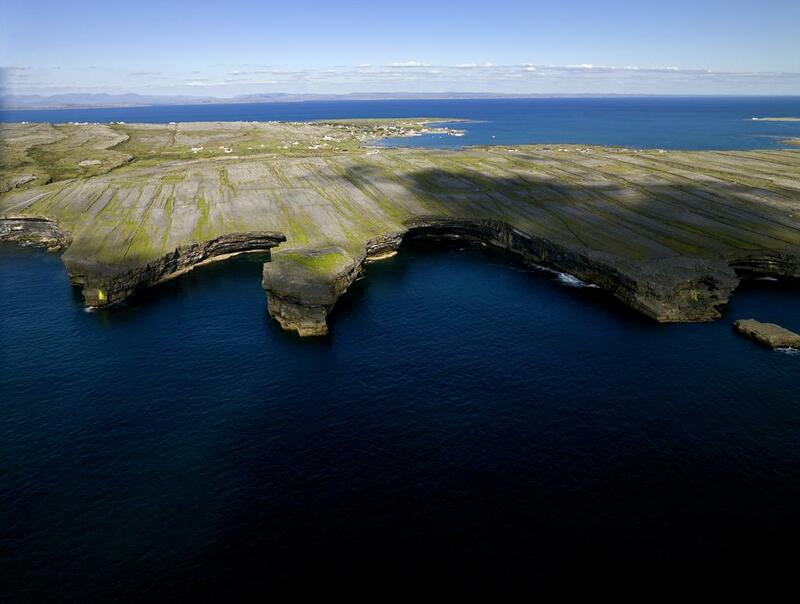 It said the 12.5mw project, proposed by the Dublin- based Power Capital renewable energy group, would have “an unacceptable impact on the archaeological and cultural heritage” of a nearby monument. The board also said its presence would result in “an unacceptable visual impact in the landscape” and that it would “seriously injure the amenities of the area”. The group had applied for 10 year permission for the construction of the farm and associated site works in the townland of Irishtown, not far from Tayto Park. An Bord Pleanála's assessment and decision can be accessed here. Dublin City Council investigating bar and restaurant facility over failure to open pool. Owners of the 132-year-old Clontarf baths, recently refurbished at a cost of €2.4 million, could be breaking the conditions of their planning permission by failing to open the outdoor seawater pool at the site. Publican and hotelier David Cullen two weeks ago opened a 250-seat restaurant and bar at the Clontarf seafront site following a two year construction and renovation programme that included the restoration of the open air seawater baths. However the baths, which closed more than 20 years ago have not been reopened for use, and Dublin City Council is investigating whether Mr Cullen may be in breach of his planning permission for failing to open the pool, while running his restaurant. A woman whose home may have to be demolished because of the planned new MetroLink rail line has accused Transport Infrastructure Ireland (TII) of behaving “disgracefully” in their contacts with affected homeowners. Margaret Gallery, who bought her Ranelagh, Dublin, home a year ago and is currently renovating it, said she learned more from an article in The Irish Times than she did from a “vague” letter she received that merely mentioned upgrades to the line. What was in The Irish Times “isn’t at all what they said to me”, she added. “It said nothing about widening it or about compulsory purchases of gardens or houses.” She received the missive on the day the project was launched last week. On Friday, I spoke at University College Cork Planning Society’s conference. If I were a planning student now, I would be concerned about the reputation and future role of my profession in Ireland. In line with other market-led development systems, over the past couple of decades, public planning has been demonised, albeit with little evidence to back up the criticisms. Far too often planning is vilified as something that mitigates against development rather than facilitates it — and in facilitating, it also makes some people very wealthy. This can be seen quite easily nowadays in the “book value” of land with planning permission, where the permission has created great value without anything necessarily having been built. Cyclists in Dublin must deal with inadequate surfaces and low-quality facilities not suitable for the young, elderly or inexperienced, an audit has found. They are also forced to weave across multiple lanes and take “circuitous” routes to get where they want to go. The report, commissioned by Dublin city council, said cycling was still considered of secondary importance compared with motorised traffic. It said that there had been only a slight improvement in cycling policy and implementation since a study carried out in 2011. The audit cited the expansion of 30 km/h zones in the city and the provision of the Grand Canal cycle route from Inchicore to the River Liffey as signs of improvements for cyclists. Irish planning minister Eoghan Murphy has urged councils to clamp down on discussion of individual planning applications before they are determined by officials and to ensure that officials don’t participate in exchanges about the merits of proposals. 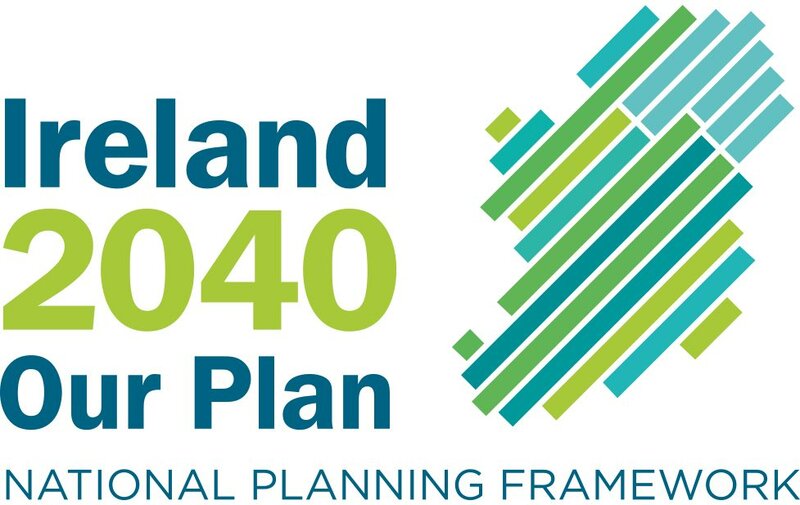 In a letter to council chief executives and senior planners signed by Terry Sheridan, chief planner in the Department of Housing, Planning and Local Government, and sent to The Planner, concern is voiced over the risk to “due process”. To follow on from yesterday’s communication, you may have seen that the new Metro Link’s Emerging Preferred Route (EPR) was made public at today’s media launch. At a meeting in Mobhi Road on Tuesday night 20th March, members of the Na Fianna Club Executive were advised by representatives from Transport Infrastructure Ireland (TII) that the construction programme for the proposed Metro Link (formerly known as Metro North and due to commence in 2020), would involve the requisition of the front pitch and both all-weather pitches on Mobhi Road as well as Home Farm soccer pitch. The front pitch and both all-weather pitches as we currently now know them would become a Tunnel Boring Depot for the duration of the Metro Link construction project, with a permanent underground station being situated under Mobhi Road upon completion. The first contact that the Club had with TII was through a phone call received at approximately 4.30pm on Friday 16th March, bank holiday weekend. This was the first time the Club was alerted that the new Metro Project would have any implication for the Club. TII requested the meeting, mentioned above, where we were informed of the severe impact the proposed project would have on Na Fianna’s home. The Club is naturally very concerned and alarmed with this news. We are also deeply disappointed by the lack of respect afforded that a decision of this magnitude was advised to CLG Na Fianna, less than 48 hours prior to the formal Government announcement. Loss of both All-Weather pitches for a minimum of 3 years, potentially 6 or more years. Though significant, this pales in comparison to the potential irreparable damage to a generation of young Na Fianna members through having the heart and soul of our Club ripped out. Not to mention the inevitable fall-off in playing numbers among all age groups, through being deprived of suitable training and playing facilities. The Executive Committee are fully aware that this development has huge implications for CLG Na Fianna and its members. CLG Na Fianna is currently examining the plans in detail, engaging with important stakeholders and exploring a range of possible actions. We would encourage all members to access the website (www.metrolink.ie), view the documents and to inform themselves as much as possible. A Members’ Information evening will be arranged in the coming weeks subject to the full facts of the proposal being examined and a suitable venue sourced, and out of this a strong unified approach will be adopted. Ní neart go cur le chéile. The GAA family, including Croke Park and Dublin GAA have committed to full support for Na Fianna and its members. We have been through tough times together before. From our founding members’ first struggles to establish the Club in the face of overwhelming adversity, from the rebuilding of our clubhouse after its destruction, and the struggles we have overcome to build a state of the art facility, and not only sustain it, but have it as the beating heart of the community. We have been through tough times before, we will rise to this challenge and come through this together. Please be assured that members will be kept up to date on progress and further communications will be issued as appropriate. In the meantime normal service continues on Mobhi Road. Glaine ár gcroí, neart ár ngéag, beart de réir ár mbriathar. Purity of our hearts, strength of our limbs, action according to our words. Dublin GAA club Na Fianna have outlined their serious concerns after plans for the €3bn MetroLink announced today revealed major disruption to their pitches. The Glasnevin-based outfit, which caters for 125 teams and has one of the largest club membership in the country, will lose their main pitch on Mobhi Road for a minimum of three years, potentially six years, during the construction phase as well as two all weather pitches for the same period. 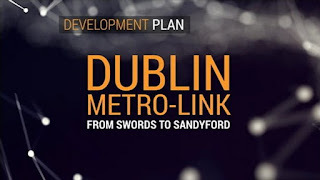 The project, which is due for completion in 2027, will see trains running every two minutes from the city centre to Dublin Airport. The club said today that the first contact they had with Transport Infrastructure Ireland was just last week. Proposed changes to Limerick’s docklands could be a key economic catalyst for the city and the region in the years ahead, according to those behind the plans. The Shannon Foynes Port Company (SFPC) launched its framework strategy for 75 acres of riverside land into an economic hub. The company has predicted that the programme could involve a minimum of €100m of development and redevelopment, potentially delivering 75,000sqm of new and existing buildings at the Ted Russell Docks, Corcanree Business Park and other sites off the Dock Road. The framework includes proposals to refurbish the 3,000sq m Bannatyne Mills, which dates from the early 19th century, into a commercial hub for up to 300 employees. It aims to promotion of the area as the Limerick Docklands Economic Park with a focus on business, technology, and marine energy uses and testing. 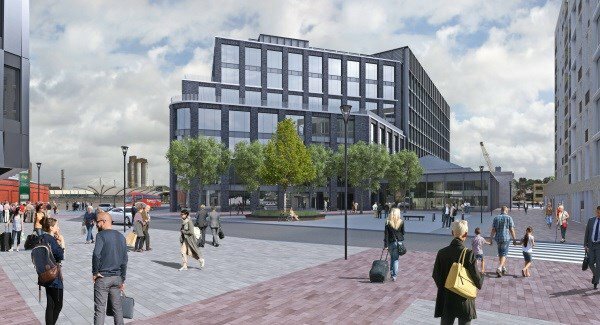 The Port of Cork Company confirmed yesterday that it has lodged an appeal with An Bord Pleanála against the decision made by Cork City Council last month to grant permission for the €160m HQ scheme at Horgan’s Quay. The appeal was lodged on Thursday just hours before the 5pm deadline. 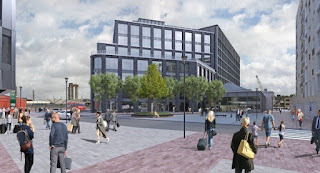 The mixed-use HQ project, proposed by BAM and Clarendon, has been earmarked for a six-acre north docks site, next to Kent train station and overlooking the port’s quays. It includes some 400,000 sq ft of office space, with capacity for up to 3,500 employees, more than 240 apartments and a 136-bed hotel across eight buildings. City planners gave it the green light late last month. But the port company, which is involved in a legal battle with BAM Civil Ltd over the tender process on part of a massive port building project in Ringaskiddy, confirmed it is appealing the decision. Play Created with Sketch. Pause Created with Sketch. Replay Created with Sketch. Volume Created with Sketch. Volume - muted Copy Created with Sketch. New apartment guidelines - why the concern?